[SureSlim] Childhood Obesity: A Chubby Kid is Not Equal to Healthy* | Vanity and Everything in Between. A report by the World Health Organization (WHO) shockingly reveals that over 3 million children in the Philippines are overweight or obese. Over the years, the prevalence of obesity and obesity-related diseases among children in the country has risen sharply. The numbers have doubled over the past couple of decades and tripled over the last 30 years. If the trend is allowed to continue through our parental neglect, inaction, or indifference, it is possible that the numbers will quadruple in another ten years. Based on the report, Filipino kids today have different eating habits and preferences. They tend to eat too much fast food and junk food, which may sometimes be full of sugar or fats. It is also evident that Filipino children have become less active when it comes to exercise and other types of games or outdoor play due to the advent of iPad and other technological device. The combination of leading a sedentary lifestyle and excessive consumption of junk food is the number one cause of obesity worldwide. The extra pounds negative impact the figure, but more importantly, obesity is an unhealthy baggage that takes its toll in terms of the development of otherwise preventable illnesses, like high blood pressure, heart disease, stroke, infertility, osteoarthritis, gall bladder disease, and many forms of cancer. A child with one obese parent is 3 times more likely to be obese as an adult, and one with two obese parents has ten times the risk. In general, the fault lies in us parents, whether we want to admit it or not. The good thing is that it is always never too late to start, no matter how old we are. Adopting a healthy lifestyle is always timely, anytime, at any stage in life. Our SureSlim wellness program is a premium, personalised and medically supervised program designed to help clients lose weight quickly, safely and permanently, while improving their health and vitality. It is thoroughly researched and scientifically formulated, based on the principles of nutrition, metabolic processes and hormone regulation. What’s great about SureSlim is the fact that they are the only weight loss program in the world that has specialized programs for everyone — kids aged 7 to 12, teens, Type 1 and Type 2 diabetics, pregnant women and nursing mothers, even Hindu and Muslim fasting programs with no maximum age limit. SureSlim is more of a “lifestyle” than a diet. There are no fads or gimmicks, just a nutritionally sound, no-nonsense approach to weight loss that clients can continue for life, allowing them to finally let go of the yo-yo dieting cycle. SureSlim programs do not count calories, eliminate food groups, or use supplements or stimulants. Rather, SureSlim takes a “back to basics” approach, looking at the nutritional content of foods including fruits, vegetables, carbohydrates, proteins, healthy oils and seeds, all low in saturated fat and low on the glycaemic index, to create a healthy and nutritionally balanced program that is tailored to each individual. The client’s blood test results, hormone levels, medical history, food likes and dislikes and lifestyle needs are all taken into account in creating a program that is designed to correct the metabolism, stabilise blood sugar and allow for excellent weight loss results that can be sustained in the long term. Importantly, clients are supported throughout their journey through weekly consultations that track progress, identify challenges and pitfalls and provide support, motivation and guidance. The program also provides a structured re-education program that empowers each individual to not only achieve their weight loss, but keep it off for life. SureSlim is an international company with outlets in Australia, New Zealand, Canada, UK, South Africa and Philippines–the first in Asia. To date, SureSlim Philippines has benefited many children and adult Filipinos, even those with medical conditions like Type 1 and Type 2 diabetics, women with PCOS (Polycystic Ovarian Syndrome), patients with low thyroid function, liver ailment, and those who has undergone kidney transplant. 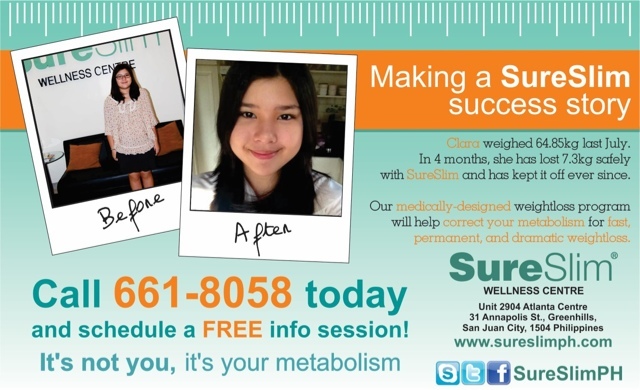 If you want to know more about SureSlim, call 661-8058 today and schedule a FREE info session. It’s not you, it’s your metabolism.